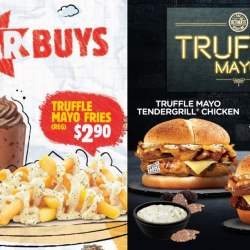 Pamper your taste buds with the creamy indulgence of Burger King's all-new Truffle Mayo burgers. Stacked with juicy flame-grilled patty, Swiss cheese, mushrooms, caramelised onions, and Truffle Mayo sauce, it’s luxury in every bite! Enjoy these latest delights at your nearest Burger King today! PS: Also try the new Star Buys - Truffle Mayo Fries, Malty Float "Gao" and Belgian Chocolate Sundae! 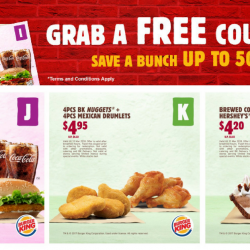 Till 30 Apr 2019 Burger King: Save Up to 50% with All NEW BK Coupons! ALL-NEW BK COUPONS are now available for unlimited downloads on the Burger King app! Or get them here from their website! Save up to 50% on your favourite meal deals and snacks now. Valid till 30 April 2019. Just flash to redeem! 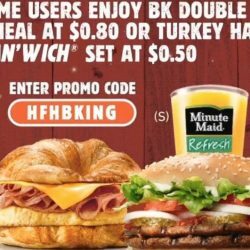 26 Nov - 2 Dec 2018 Burger King: Enjoy a BK Double Whopper® Value Meal at $0.80 or Turkey Ham Croissanwich’ with Egg Set at $0.50 via KLOOK! [BK Naughty or Nice Holiday Deals] No matter where you are on Santa's list, Burger King has got treats for ya! 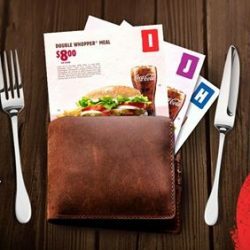 For a limited time only, enjoy a BK Double Whopper® value meal @ $0.80 or Turkey Ham Croissanwich' with egg set @ $0.50 when you book through KLOOK. Remember to use the below coupon code before payment! 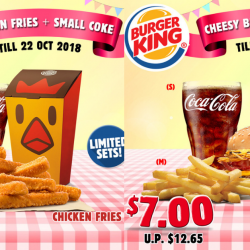 Till 22 Oct 2018 Burger King: Save Up to $5.65 on Cheesy BBQ Beef Value Meal & Chicken Fries Set! 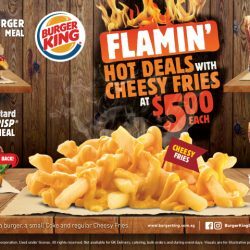 Save up to $5.65 on your Cheesy BBQ Beef Value Meal & Chicken Fries Set at Burger King! Just grab these Qoo10 deals and show the coupons at selected BK outlets to redeem! 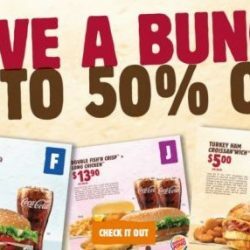 Till 31 Oct 2018 Burger King: Save Up to 50% with All NEW BK Coupons! 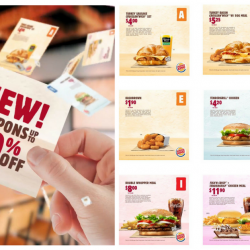 ALL-NEW BK COUPONS are now available for unlimited downloads on the Burger King app! Save up to 50% on your favourite meal deals and snacks now. Valid till 31 October 2018. Just flash to redeem! 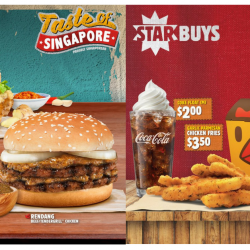 1 - 10 Aug 2018 Burger King: Enjoy Taste of Singapore Meals for Just $5.30 Each (UP $7.95)! 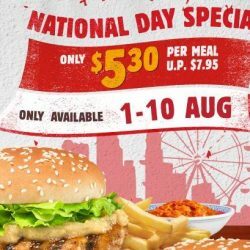 [EXCLUSIVE NATIONAL DAY PROMO] To celebrate SG53, Burger King is offering Taste Of Singapore meals for just $5.30 each (UP $7.95)! Choose between the Rendang beef/Tendergrill™ chicken or Hainanese Tendergrill™ Chicken burgers, plus a side of fries and a drink! Promo valid from 1 - 10 August only, while stocks last. 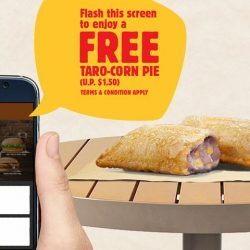 Till 1 Jul 2018 Burger King: Flash BURGER KING® App for FREE Taro-Corn Pie with Any Purchase! 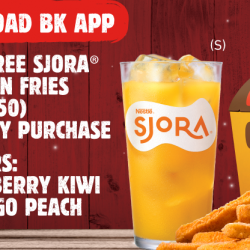 [BK APP SPECIAL] Flash the BURGER KING® App from your phone to enjoy a FREE Taro-Corn Pie with any purchase! Offer valid until 1 July 2018 only, at all BK outlets islandwide. 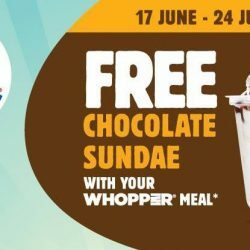 Till 24 Jun 2018 Burger King: FREE Chocolate Sundae with Purchase of WHOPPER® Value Meal! Enjoy a FREE Chocolate Sundae this Father's Day! Just share this post on your FB profile and flash it at the counter with purchase of a WHOPPER® Value Meal at any BK outlet! Offer is valid till 24 June 2018. 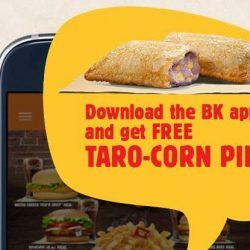 [SWEET BK APP PROMO] Enjoy a FREE Taro-Corn Pie with any purchase and by flashing the BURGER KING® App from your phone! 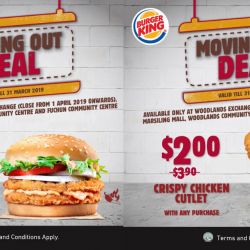 Redeem at any BK outlets islandwide. Promo valid from now till 1 July 2018, or while stocks last. T&C apply. 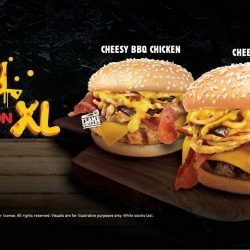 Burger King: The Cheesy BBQ Turkey Bacon is back…and bigger than ever in XL! The Cheesy BBQ Turkey Bacon is back at Burger King...and bigger than ever in XL! Now comes with a 5" flame-grilled beef or chicken patty under layers of Turkey Bacon, Crispy Onions and American Cheese topped off with BBQ and nacho cheese sauces. Bite into one today, only at Burger King! 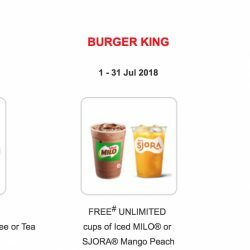 Till 31 Jul 2018 Burger King: Save Up to 50% with These E-Coupons! 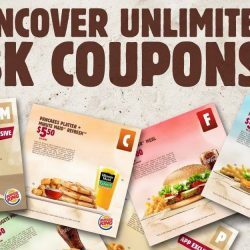 New free-for-all Burger King coupons are available for download! Save up to 50% OFF on BK meals. 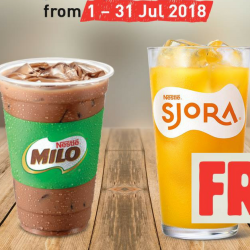 Valid till 31 July 2018. Just flash to redeem! 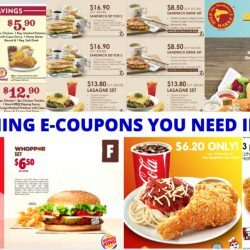 Till 31 Mar 2018 Burger King: Save Up to 50% with These E-Coupons! The only thing better than coupons is BK coupons! 50% on over 10 BK meal deals await you, save them all! Valid till 31 Mar 2018. Just flash to redeem! Limited time only! 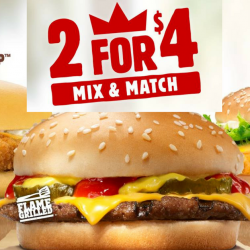 Burger King: Enjoy Any 2 Burgers for only $4! Say hello to a deal you can't resist! Enjoy any 2 burgers of your choice for ONLY $4 with Burger King's 2-FOR-4 offer! Choose from Fish 'N Crisp, Cheeseburger and Chick'N Crisp w/ Cheese. For a limited time only! 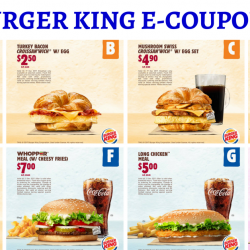 Till 31 Mar 2018 Burger King: Save Up to S$13.70 with These E-Coupons! 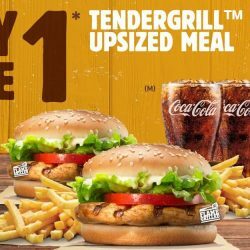 Till 17 Dec 2017 Burger King: Save Up to $13.70 with e-Coupons! 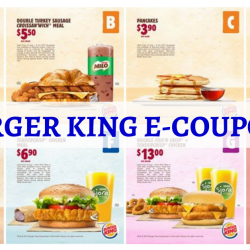 Till 8 Oct 2017 Burger King: Save up to $9 with e-Coupons! Whether you’re craving something crispy, tender or sweet – bite into one of these amazing deals! Stretch your dollar at Burger King with these coupons! Simply flash ‘em at any outlet and enjoy delicious treats at affordable prices. 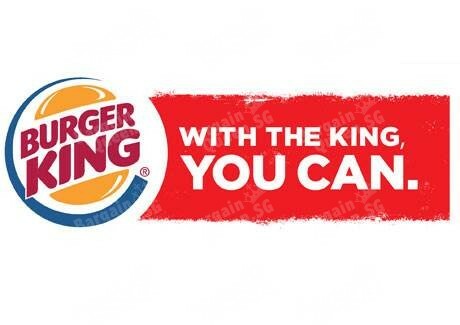 Coupons are available at www.burgerking.com.sg/coupons. Valid till 8 Oct 2017. Terms and Conditions apply.